An eerie moor of peat bogs and dark lochs. 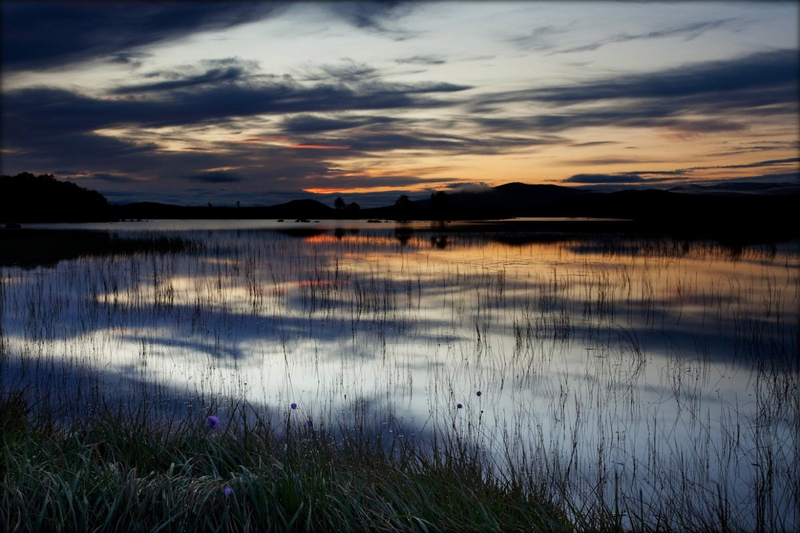 Its very name evokes kelpies and lost souls who wander about shrouded in mist; but it's said that Rannoch moor was also used as a hide-out base by Robert the Bruce and William Wallace during their battles against the Brits. 'Kelpies' are mythic Celtic water-horses. Perhaps the name originates from the Gaelic 'Cailpeach'. The legendary creature is reputed to be a powerful horse with a black, white or sometimes even a green hide similar to seal skin. Kelpies are allegedly sticky, deathly cold and always dripping wet. They are said to be able to create illusions and transform themselves into beautiful women in order to trap gullible, love-sick men. Perhaps the deceived, doomed men then become the lost souls who wander about, shrouded in mist. Other versions describe them as pitiless, child serial-killers. Such a kelpie would first entice a child to mount on its back. Once mounted the doomed child would no longer be able to dismount being stuck fast to the kelpie. The horse would then gallop to its loch and disappear into the dark depths, drowning then devouring the child. It would gobble everything up except the child's heart and liver. This might have something to do with the kelpie's digestive system. But legends about kelpies are not all necessarily cruel, gruesome and tragic. For example there is the story of The water-horse bridle of Nether Lochaber. It was originally told by a certain Doctor Stewart. The following is a slightly more embellished version. A drover who lived in Nether Lochaber had spent the whole day at a market in Pitlochry. Although it was already nightfall, he decided to return home by way of Rannoch Moor. 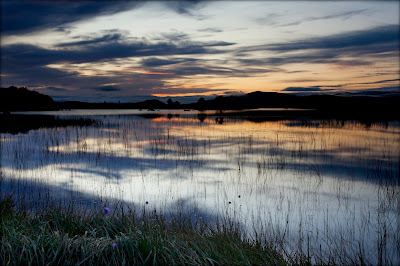 The drover was well aware of the moor's haunted and ghoulish reputation, but as the moon rose full and bright, he was in good spirits, and never believed half of the ghostly stories in any case, he bravely plodded on until he came to Lochanna Cuile. There he sat down upon a mossy knoll and ate what was left of a cheese sandwich he still had. Whilst he ate he heard the cry of a nightjar. He looked up and there sure enough the bird swooped low just above him. As the drover followed its flight, he saw something flash in the heather, as though the nightjar had caused it. The drover got up, his eyes still fixed to where he saw the flash, and advanced towards it. There he discovered an elaborate horse's bridle. As the moon was by then veiled by rising mist and low cloud, the drover simply put the bridle in his bag, and briskly continued his way home. Once there he had a wee toddy before going to bed. The following morning when he examined the bridle, he couldn't believe his eyes. The bit, rings and buckles were wrought in solid silver and embellished with fabulous elaborate intricacy. The reins and halter were made with beautiful soft leather with a strange patterned texture of fine, muted colours. But what astonished him most of all was that the bit was often far too hot to touch. The same day he talked to his neighbours about the bridle. One of them suggested that he seek the advice of a wise old woman who knew all about this sort of thing. She lived alone in a little, grey, slate-roofed house by a small loch on the other side of the glen. Curiously she seemed to have been expecting the drover's visit. As soon as she saw the bridle, she simply nodded. It was a water-horse's bridle. Perhaps even a king kelpie's. She explained that the heat produced by the bit, was a timeless, magical phenomenon. The heat was indefinitely retained from the actual moment when the silver was first cast. The leather was that of a water serpent, a creature known to haunt the deep lochs also favoured by kelpies. And this is what the drover did. Sure enough he was blest, and sure enough he prospered in all that he set out to do. Thus so he lived out a long and happy life. The drover never had any children, but he did have a grandnephew by the name of Calum. Now Calum had never known his great-uncle, nor did he know anything about the water-horse bridle. One day a mysterious messenger on horse back arrived where Calum lived. He had brought a small parcel. He told Calum that it was from his great-uncle who had recently died. In the parcel pinned to something very warm wrapped in thick cloth, he found a letter. It was a short message explaining what he should do with his great-uncle's gift. 'You must find a rowan branch with a wee crook, then hang this bridle from it. It will bless you, and your dwelling, and surely it will make you prosper in all you set out to do'. And throughout his life this is what Calum did. And this is what his children, their children, their grand children, their great grand children and their great, great grand children did too. And they all lived out their long lives very happily indeed.